First fry the capsicum lightly with a tsp oil and keep aside. sprinkle little salt and saute it , fry the onions lightly. Add the potato and turmeric powder,mix it well and fry . Turn the heat to low,close it with a lid and cook for 4 minutes. Open the lid for every 1-2 minutes ,give it a stir and fry well. Once the potato get half cooked or becomes little soft add the fried capsicum and all dry powders, salt as needed and mix well. 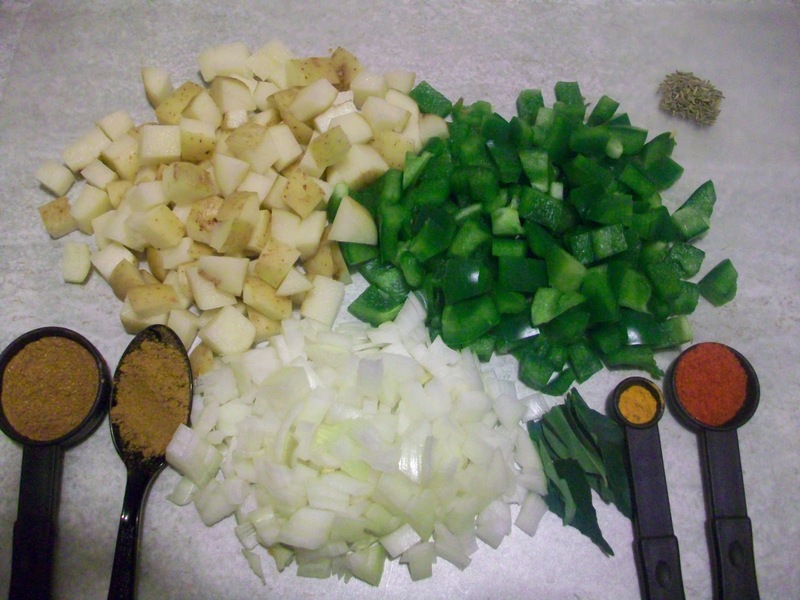 Close the lid and cook till the raw smell of the masala goes . no need to add water ,cooking in low heat with closed lid will make the potato soft and tastier. At last add the chopped coriander leaves and serve hot as an accompaniment of your choice, but goes well with phulka,rotis,dosa,any rice,pulao etc. Not only green bell pepper you can also add yellow and red peppers. Try to use curry leaves, since it gives nice flavor to the curry along with fennel seeds. Adding more onions gives nice taste n the moisture form the onions makes the curry not dry but juicy. 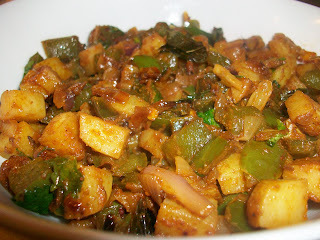 Sending this recipe to Vardhini's Dish It out ~ Potatoes N Bell Pepper Happening @ Tomato Blues. lovely dish. perfect for rotis. I tried this recipe with baby potato, red and green capsicum. Also, I added 2tbsp of ground peanut at the end. This recipe turned out really tasty and spicy. It was loved by all the guests. Adding peanuts will give nice flavor n crunchy taste, thanks for your feedback. Glad that u all liked it..